Valdez Alaska is about 363 miles drive from Fairbanks. A long 6 hour drive or more, but I've always enjoyed the travel down there. On our fishing trip down to Valdez last September, we stayed at the Valdez Glacier Campground. Run and operated by U.S. Military and the City of Valdez. We paid $60 for 3 nights stay. The fee wasn't bad and of course if you're military you'll get discount. 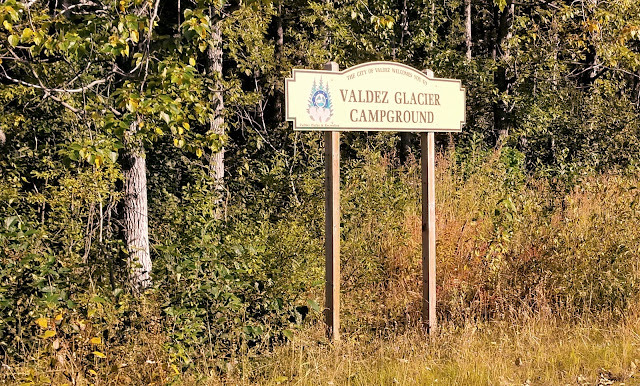 Valdez Glacier campground is good base for Valdez adventure. 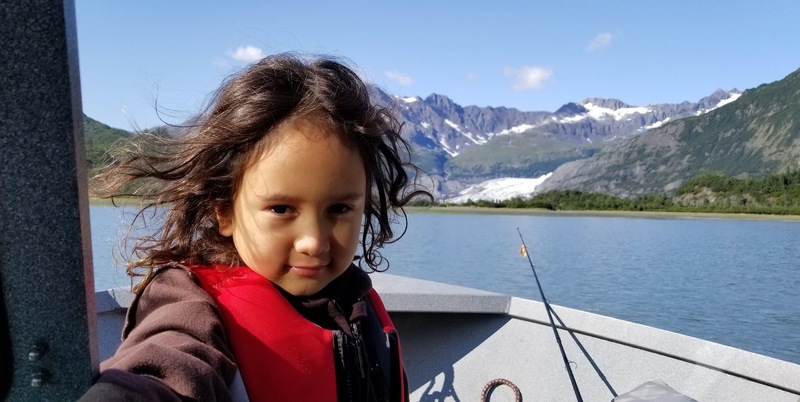 A little drive down the road and you'll see the Valdez glacier, access to the river for kayaking, and a shooting range. We arrived at the campground late at night. We were pulling a boat so we needed a place where we can park both our boat, truck and have enough space for tents. We drove around looking for available camp spot and it didn't take long for us to find one. It was a really good spot. Big space, secluded, woods and brushes surrounds the campsite it was great for privacy. It has fire pit and a picnic table. 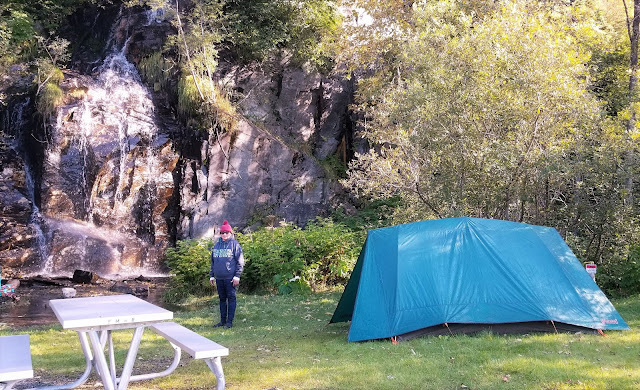 Our campsite was closed to the waterfall where we can hear the water guzzling down from the mountain, it was really cool, I liked it. I also love seeing the stars clearly shining bright at night, it was amazing! On our second night there at the campground, it was around midnight, I woke up to a rumbling noise outside our tent. I was so nervous. At first I didn't know what it was, I was waiting for my dog to bark or something but she never did. I woke my husband up and I stood up went to the door, picked through the window of our tent, it was so dark, couldn't see anything. Using the light on my phone, I saw my dog crawled under her blanket and without any noise from her. I grabbed my truck keys and started it using my auto start (thank goodness for that) and I also had the alarm on and off. After few minutes, I went back to bed. However, the rumbling sound came back. I then grabbed the portable flood light and point out to where the noise was. I then saw our coolers that was inside our tent (over the picnic table) was taken out and was upside down on the ground. 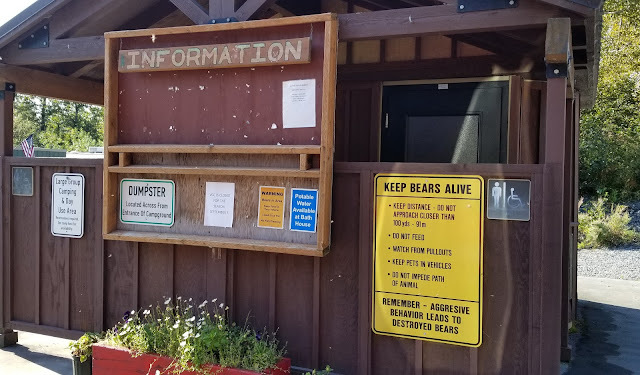 I pointed that light everywhere but didn't see any bear. I then heard people making noise, car alarmed went on and off, and then a gunshot afterwards. I went back to bed, nervous but a eventually fell back to sleep. The morning came, we found bear claws all over the 2 coolers and also ripped on the tent. The bear managed to open up one of the coolers, the one that has milk, fruits and whatnot on it.The bear tore the milk carton and also ate some of the fruits that was in there. I know it was our responsibility to keep the food away. But our food cooler will not fit on the cab of my truck. That's why we securely closed the coolers, cover them with blue tarp and place them inside the tent by picnic table. But I guess that was not secure enough. On our third night we stayed a bit up outside, we had our camp fire going, hanging out, listening to music, just enjoying our stay there. That time, we placed all our coolers in the back of the truck and in the boat. 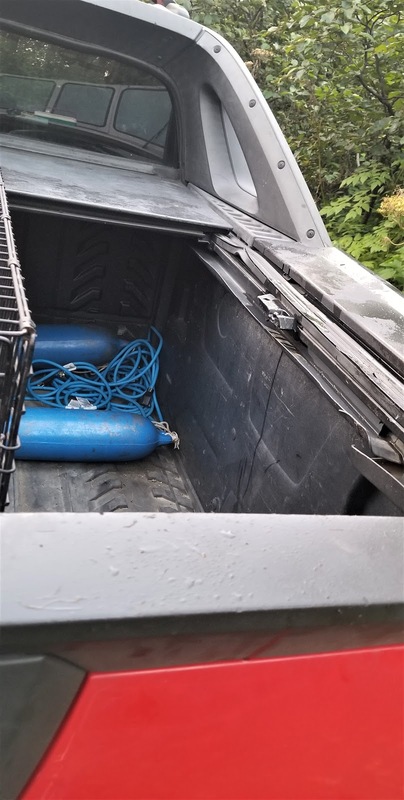 The back of the truck was partially covered but with all the stuff in there it was tight. We went to bed and just about to fall asleep around 1am, I woke up to the rumbling noise again. This time I grabbed the big flash light and through the window of our tent I pointed the light towards my truck and boy I saw this bear looking back at me (or my light) he was on top of the covered part of my truck. His look was just like a kid that got caught in the cookie jar. He paused for few seconds, I hurried back to grabbed my phone but the bear already jumped off my truck. It would a been a great capture if I only had the phone with me. After the bear left our campsite, he visited others too. I heard big voice shouting and engine starting, alarm on and off but I don't remember if I heard a gunshot that time. I tried to wake my husband up but he was sleeping like a baby. And my sandy the dog didn't make a single noise. She was more scared than I was. 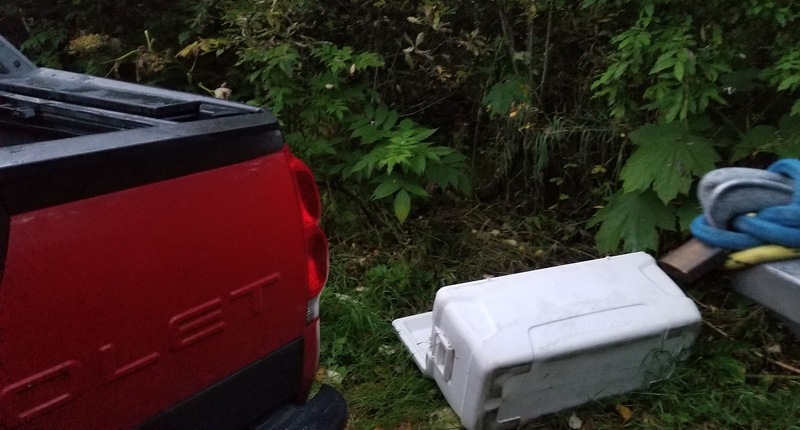 The next day we found the big white cooler opened on the ground. The fish was gone, the only fish I caught, and the bear took it. That cooler was tucked-in tight in the back of my truck and also covered half way. Dang bear, the ocean is near with lots of salmon getting ready to die easy to catch but no, he took my only salmon instead. It was alright though at least we are safe and no damaged to my truck and to the boat. Bear got in the boat as well. I'm so glad the bear didn't go into our tent. I guess nothing there for him, no food! 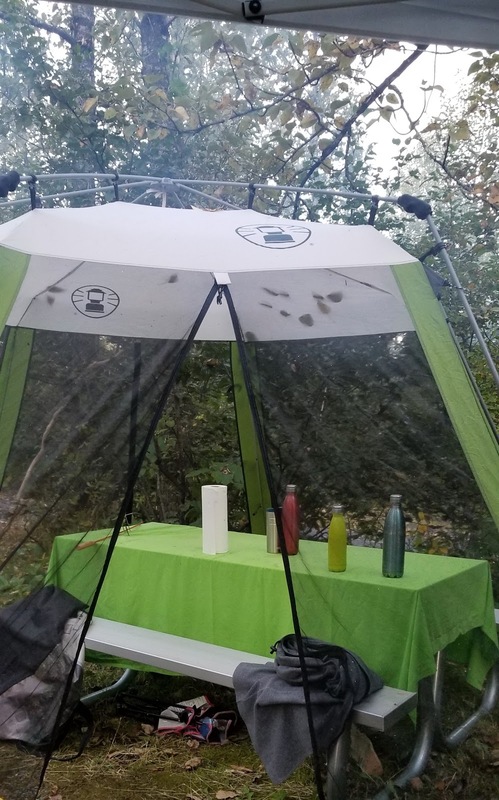 Never bring any food in your tent because that's what bears are after. Valdez Glacier Campground located about 3 miles on Airport Road. Cooler on the ground - Fish gone! 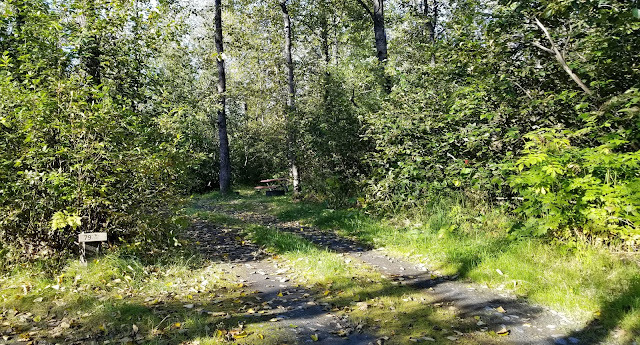 At the entrance of the campground -there's Potable water, shower, restrooms. My son Alan - We had a great day fishing. 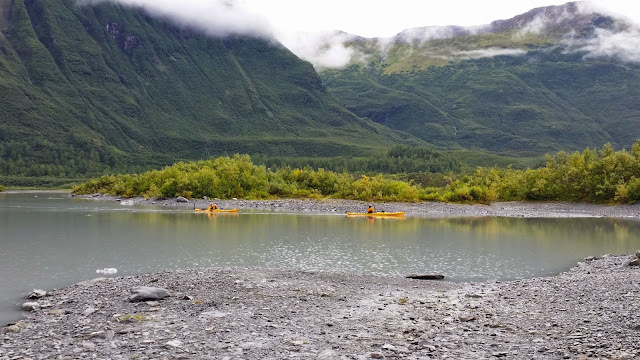 We took a short trip to Shoup bay and to see the shoup glacier. Shoup glacier is a lot smaller now than what it was the last time I was there. A great afternoon drive from Fairbanks to Valdez. 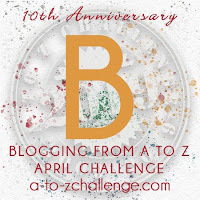 I'm blogging from A to Z this month of April, please join me.